Forgetting to put one sock in the machine won't be a problem any longer if Samsung has anything to do with it thanks to the new WW8500 AddWash washing machine. The new machine, which was unveiled earlier today at IFA 2015, has an extra door inside the front that allows you to add clothing to a cycle that has already started without worrying about a flooded kitchen or utility room floor. It works by pressing pause on the control panel and within a matter of seconds the extra door is open when any number of new items can be introduced, which isn't just limited to clothing and also includes detergent or fabric softener. You could even add hand-wash items at the start of the rinse cycle. To prevent children tampering with the new door there is a child lock on board and the machine is fully tapped into Samsung's smart home ecosystem. Thanks to this you can get smartphone notifications to tell you when a certain cycle is starting in order to add in delicates or hand wash items to be rinsed. 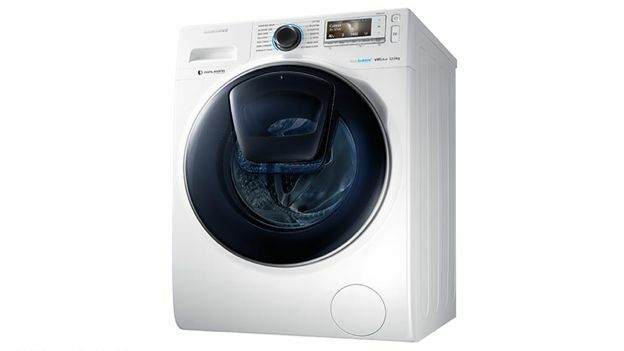 Among the other technologies present on the machine is a SuperSpeed setting that completes a normal wash in under an hour, a Digital Inverter motor to bring better energy efficiency and ecobubble tech that pre-mixes detergent and water to penetrate stains at a level that is 40 times faster than usual. Pricing and a release date is sadly lacking at this juncture and we can expect to hear more over the coming months. In the mean time, hold fire with those odd socks! Which washing machine is too cool for electricity?